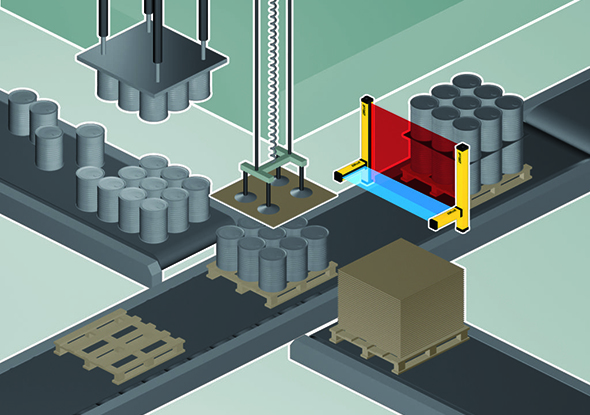 A safety relay has an important role within a safety system. Potential hazards of machines or installations must be managed safely. Safety switches monitor the status of safety devices. When an unsafe situation is detected, the safety relay will give a signal that switches off the energy to the potentially dangerous machine or safely interrupts the safety circuit. A safety relay can manage one or more safety switches, such as light curtains, photocells, emergency stops, laser scanners, electromechanical switches, magnetic switches, lock safety door switches, RFID switches, safety mats and so on. 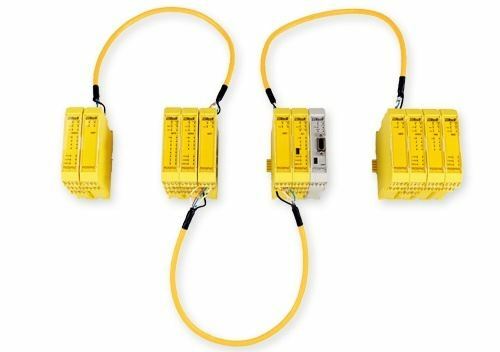 A safety relay has two functions; on the one hand the processing of the signals from the connected safety switches and components and on the other hand the safe and reliable interruption or disconnection of potentially dangerous machine (functions). In addition to 'standard' safety relays, there are also wireless and programmable safety relays. In applications where there is little or no room for cables, a wireless safety relay can offer the solution. If it is desirable for only a part of the connected safety switches to switch off or fall into emergency stop when an unsafe situation is detected, a programmable safety relay provides the solution. In the detection of an unsafe situation it may be desirable that not all connected safety switches switch to emergency stop or switch off. 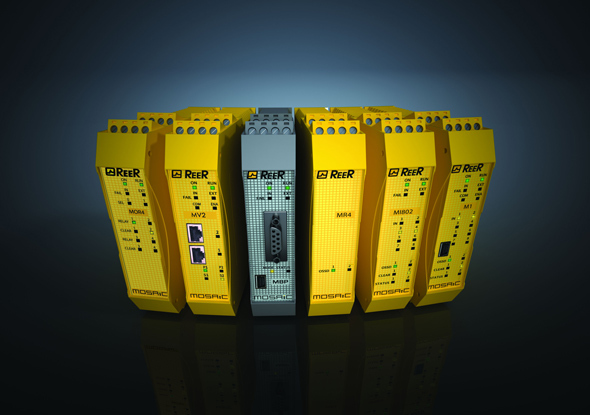 A flexible programmable safety relay offers the solution here. 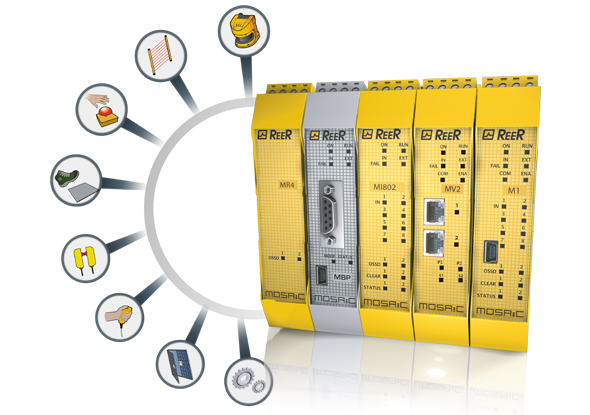 The Mosaic from ReeR Safety is a modular programmable safety relay for securing machines and / or installations and makes configuration of safety circuits easy for every application. View the application example. 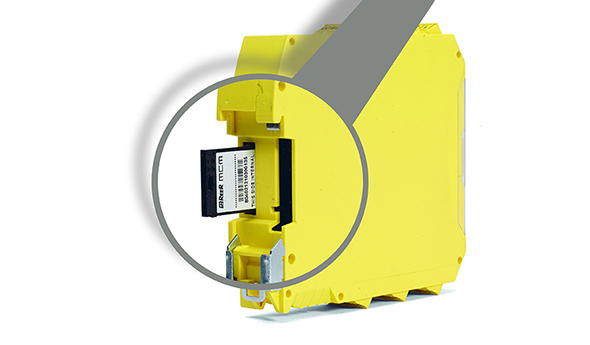 The modular programmable safety relay from ReeR consists of one main module and can be extended with seven other modules that are connected via the bus at the rear. The main module M1 can act as a standalone relay for the protection and monitoring of smaller machines, for example 1 safety light curtain, 1 emergency stop, 1 magnetic sensor and 1 two-handed switch or as main module to protect complex safety systems of larger machines. The programmable safety relay is suitable for monitoring various safety sensors such as safety light curtains, laser scanners, photocells, mechanical and magnetic (end) switches, mats, emergency stop and emergency stop buttons, encoders, RFID switches, handle switches and two-hand operation in one flexible system. You are not affiliated with ReeR when compiling your safety system and when using ReeR Mosaic. Other safety components can also be connected to ReeR Mosaic. View switches for machine safety. Compared to traditional safety relays, the programmable modular safety relay from ReeR offers a number of notable advantages. The Mosaic reduces the number of components in the electronic cabinet. 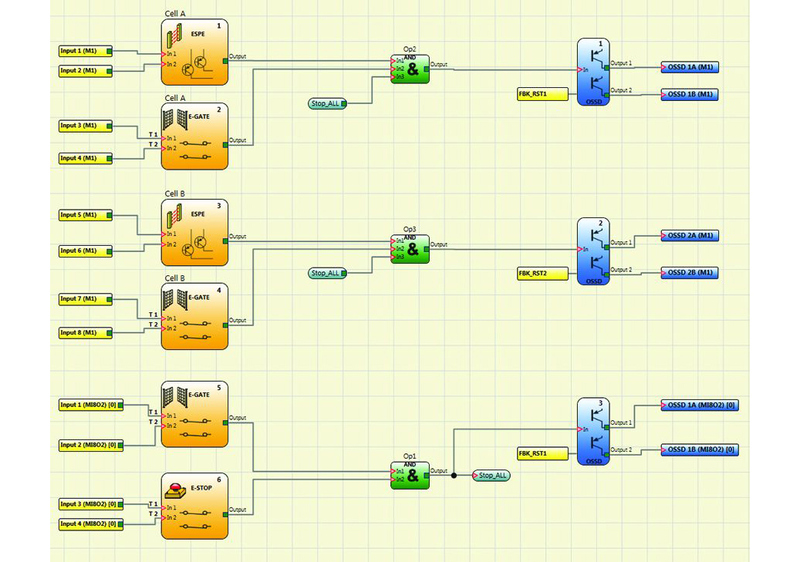 All logic is configured by a graphical interface. This ensures less wiring and a lower footprint and promotes fast construction of the electrical cabinet. A lower number of electromechanical components also ensures a higher safety level. With the programmable safety relay from ReeR a Performance Level e / Category 4 is possible. Thanks to the simple programming software, the necessary configuration is supported, machine builders can always change the configuration logic. Safety components can be added or removed at any stage during the design of the machine or technical installation, using the user-friendly software. The main module M1 is configurable via the MSD (Mosaic Safety Designer) graphical interface, which is supplied with each main module. The MCM memory card can be used to transfer the configuration program in a few easy steps to a new Mosaic safety relay. The Mosaic makes it possible to set up fraud-proof security systems. During the design phase it is possible to check the logical configuration using the validation function. Thanks to the simulation function, the safety system can be tested and simulated during installation via the monitor. The Mosaic allows manipulation-resistant system configurations, for example detecting attempts to circumvent the safety components. During the start-up of the machine, a mandatory test is required to check the safety device. The entire project is protected against unauthorized changes with 2-level password. The project shows the actual values ​​PFHd, DCavg and MTTFd according to EN 13849-1 and EN 6206. The main Mosaic M1 module from ReeR has 8 digital inputs, 2 safety outputs, 2 start / restart inputs, 2 programmable digital signal outputs, 4 test outputs for sensor monitoring, LED signaling and a USB interface to connect the M1 to a PC via a USB cable. The M1 main module has undergone a true transformation. The new main module M1S functions include four independent OSSD safety outputs (up to Pld) or 2 OSSD pairs (PLe) and the possibility to process 128 logical operators, making your security applications more powerful. 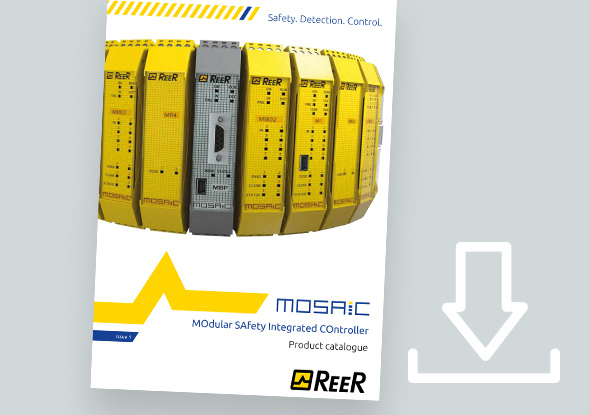 The Mosaic safety relay from ReeR is also expandable with external modules in addition to the programmable function. The communication module MB is a fieldbus module. You can choose a communication module that operates on the basis of one of the following communication protocols: CANopen, DeviceNet, EtherCat, Ethernet IP, Profinet, ProfiBus or a USB interface. You can monitor a maximum number of revolutions of carousels or centrifuges with a speed monitoring relay. When the number of revolutions of a machine becomes too high a dangerous situation can arise. To protect machines and persons against unsafe situations and to meet the set standards, a speed monitoring relay is used. Read more about speed monitoring relays. If the main module M1 has insufficient inputs or outputs, the programmable safety relay Mosaic can easily be extended with an additional module with inputs or outputs. The programmable safety relay Mosaic from ReeR Safety is easy to program with the supplied software. The image on the right shows the basic screen of a security system entered in the MSD software. 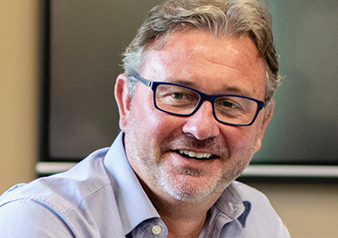 The software works through 'drag and drop'. All different parts can be dragged and moved. The ReeR M1 main module has a USB connection that allows you to connect the main module to your PC via a USB cable. 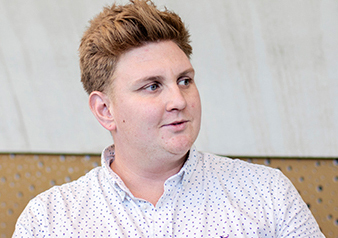 The software allows to validate the software design in the form of a simulation and project report. The project report contains the name of the project, configuration, safety information (PFHd, MTTFd, DCavg) and the modules, resources and parts used. The software generates a log file with the date when the project was created with the related checksum (CRC 4-digit hexadecimal identification) which is stored in the M1 module. If it is a standard security system or largely standard, the 'Mosaic Configuration Memory' is a time-saving solution. A previously programmed security system can easily be transferred to another ReeR M1 module by means of a memory card. Because of the modular system it is easy to add more modules. For example I/O, remote and bus modules. 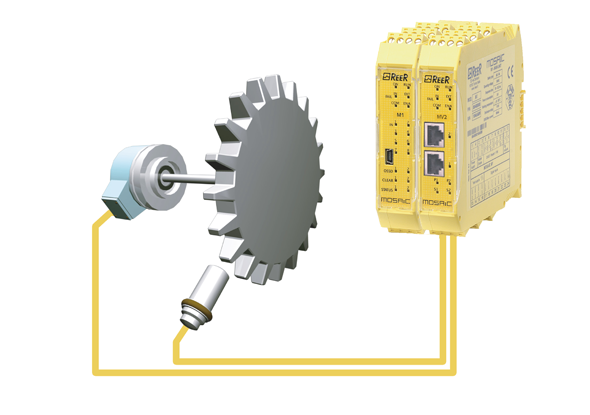 With remote interface modules it is possible to secure a complete machine line. Exchangable memory so it is easy to transfer software settings with out use of a pc.